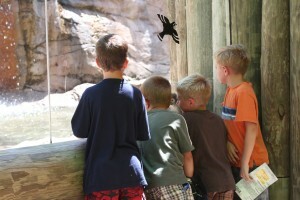 We are glad you are considering a group visit to Cameron Park Zoo! In order to receive the group discount, groups must be scheduled at least two weeks in advance and one person will need to pay for the entire group upon arrival. Please fill out our Registration Form and return to zadmissions@wacotx.gov or fax to 254-750-8430. Submitting the registration form does not guarantee the date or time requested. You will receive a confirmation once your request has been processed. Please call 254-750-8400 for more information on availability. Please note we do not accept POs or late payments. Payment must be made when your group arrives at the Zoo. To receive the group discount, parents must pay with the school group. Any adults that pay separately from the group will be charged regular zoo admission. When you arrive at the Zoo, please stage your group in the Front Plaza and send one adult to the ticket booth to check in and pay for your group. Because we do not allow outside food or drinks into the Zoo, we do allow school groups to exit the Zoo for lunch and re-enter when finished eating. You can also schedule a group lunch through our Café by calling 254-750-8432. Students must stay with an adult chaperone at all times (One adult per every 10 children for grades K-12). We suggest placing name tags with an adult chaperone’s contact information on each student. This way if a student gets separated from their group, we can easily reunite them with their group. Any behavior that endangers the safety of our animals, staff or other visitors will result in your group being expelled from our facility. If a refund is necessary, it will be processed within 7-14 business days. Take a look at our Teacher Resources page for our Scavenger Hunt and other resources. For an extra special trip, check out our Animal Presentations.